Why should you Test and Tag your workplace? Test and Tag is the only way to ensure we can minimise the risk of injury or death by electrocution to you, your employees or clients at your workplace plus reducing the risk of property and asset damage due to electrical fires, this includes all appliances, leads, power boards and tools within your place of work… basically items you use every day. 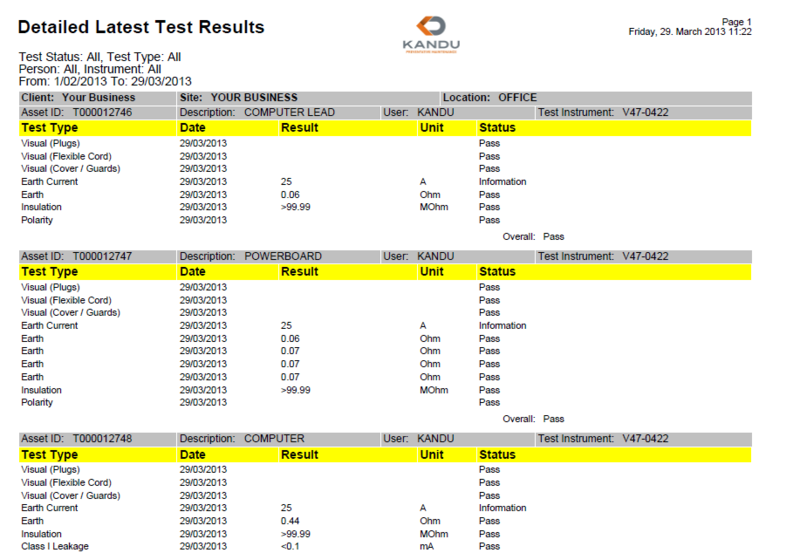 A Kandu Preventative Maintenance Test and Tag service gives you the confidence and the peace of mind that you deserve and we are able to offer solutions for all electrical appliance and equipment testing. Using a fully Qualified & Insured technician for your test and tagging ensures a competent person is undertaking the inspection and testing of your electrical equipment. An initial visual inspection of all of your appliances & leads, this will identify any obvious damage or problems immediately. We then carry out a test all of your appliances using a fully calibrated Portable Appliance Tester, our PAT testers come with pre-set tolerances to Australian Standards, ensuring integrity in our testing process. If the appliance passes the electrical testing process, it is then fitted with a durable, non-reusable tag to indicate to users that the item has been identified as safe in accordance with AS/NZS 3760:2010 and when the item is due to be tested again. Whether your test and tag requirements are for one electrical appliance or thousands of appliances, extension leads, power boards or construction tools, please challenge KANDU Preventative Maintenance to provide a competitive quote for your next test and tag program and why not ask about our other services including Exit light test & maintenance, Thermal Imaging, Fire Extinguisher Testing, Energy saving light globe supply and replacement, Microwave Leakage & RCD Safety Switch Time Testing….. Remember “Trusted service doesn’t just happen by accident”. KANDU Preventative Maintenance Thermal Imaging Services are leading specialists in the area of Test and Tag Services within the Geelong and Melbourne regions and can guarantee independent advice and guidance to meet your individual requirements.